The Rocking Footrest by AIData has a curved base that provides movement to accommodate the desired angle at the ankle, including a 'rocking' movement (Note: The platform cannot be locked in position). The Rocking Footrest is made of high-impact plastic. 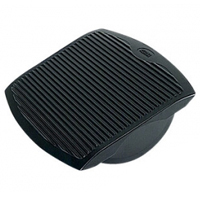 The base has rubber padded feet to keep the footrest from moving during the rocking motion. The platform is 17.7" x 13.8" and is textured with lateral ridges to reduce the possibility of feet slipping off the platform.